It’s simple: opt for some low-sugar ingredients that will help you bulk up your muscle, not belly. But where can you find recipes to shake up your protein plan? Good question: we’ve got some quick-to-make DIY shakes devised by Baptie to help you build muscle all day long. You’re welcome. When it comes to protein powder, there’s no such thing as cheap and cheerful. According to Baptie, if your shake contains a concentrate powder with a suspiciously low price and a long shelf life then you’re forking out for something packed with fat and carbs. Isolate protein. It’s a touch more expensive, but when it comes to powder you get what you pay for. “Due to its long refinement processing, isolate will give you a higher quality protein without the unnecessary additives,” says Baptie. Not sure your current shake packs the right punch? Check one scoop of your powder contains at least 20-25 grams of protein, just like this LA Whey Golddoes. Drop below that and you’ll soon notice your wallet shrinking and belly bulging. You really can have too much of a good thing. If you’re filling your shopping basket to the brim with chicken and powder tubs then we’ve got some bad news: you’re just going to the additional calories could just be increasing your waist line In fact, trying to copy the diet of professional athletes will only set you up for a career in one sport: sumo wrestling. Calculators at the ready: you need 1.6-2.0 grams of protein per kilo of bodyweight per day if you want to bulk up. This means if you’re the UK average of 83kg, you need at least 133 grams of protein each day. Don’t be put off if this sounds like a lot as one chicken breast contains around 30 grams of protein. "This means you can easily consume enough without resorting to supps,” says PT Peter Parasiliti. If you’ve already chowed down a protein-packed chicken salad for lunch and a bulk-up burger for dinner then you've already met you protein requirements. If your busy work day makes it too tempting to trade in a meal for a shake then prep your lunchtime the night before. “Focus on things like fish, chicken, turkey, beef for the best protein. They’ve got far more nutrients to keep you full,” says Baptie. That’s right, investing in some foil, tupperware and a Mexican tuna salad is a key step to a chiseled core. Cheap protein shake powder not only comes with an extra dose of carbs and fats, but also strips away the amino acids vital for muscle growth. Not only will you struggle to add size, you’ll recover more slowly too. That means sore muscles putting the breaks on your performance. Keep your eyes peeled for two things: BCAAs and leucine. 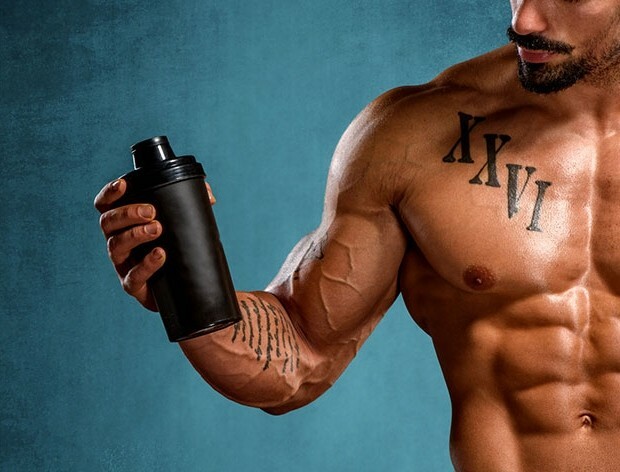 A quality powder will be jammed with BCAAs (branched-chain amino acids) crucial for growth. And leucine? “It’s is the key acid that stimulates muscle protein synthesis and growth,” says Baptie. “You need 3 grams of leucine to start this process." Always read the label. Don’t think your shake is up to the job? Try a powder like Optimum Nutrition Platinum Hydro Whey that ticks all the amino acid boxes. A lot of protein powders will contain dairy, soy, corn starch, and additives your body may be unfamiliar with or allergic to. Whey is by far the most popular powdered protein and, if you have an issue with dairy, whey will have all the same problems being as it is, a milk derivative. Soy protein isolate can be cheaply obtained and can cause inflammation, nausea and skin conditions. Corn starch has a habit of sending your blood sugar into peaks and troughs. Reading the long and complex ingredients list can be tough going but may just save your workout.